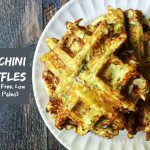 These savory zucchini waffles are gluten free and low carb. They make a great low carb breakfast or snack and you can even freeze them for later. Only 5 ingredients and 3.1g net carbs per waffle. Grate your zucchini and onion in a food processor fitted with a grating blade. Or grate by hand. Take the grated mixture and put in a tea towel or a few layered paper towels and ring out as much water as possible. In a mixing bowl, beat eggs with a fork and add cheese and zucchini mixture. Mix well. Add a heaping spoonful to your prepared waffle iron and cook according to your manufacturer's instructions. Some waffle irons require you oil them. Ours did not so check to see if you need to do that first so they don't stick. Eat immediately or freeze for later. To eat from frozen just microwave for 30 seconds to 1 minute.